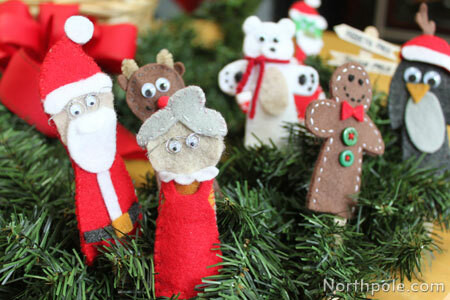 If you are looking for gift ideas for teachers, parents, or kids, make these adorable finger puppets. Pair the puppets with a storybook to make story time more interactive at home or at school. 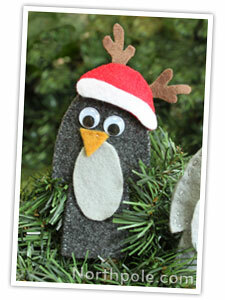 These cuties can even be added to gifts for friends without children for some extra holiday cheer. 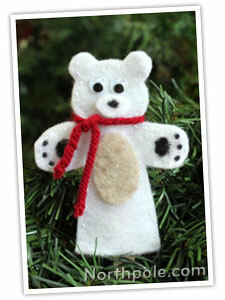 Slip a puppet over a pen, a utensil, or a chocolate dipped spoon. Pair it with cocoa mix (homemade or single-serve packets) and a pretty mug, and you’ve made a memorable, edible, and lasting gift. Decide which characters you want to make. Lay pattern pieces on felt (color appropriate) and lightly trace with a marker. 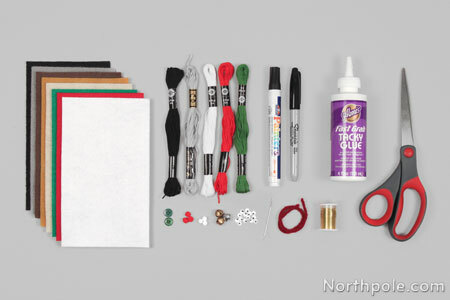 Before you glue anything, arrange pieces together as a trial run. See below for more details for each character. Stack front and back body pieces together. Sew along outer edge, but be sure to leave the bottom edges open. 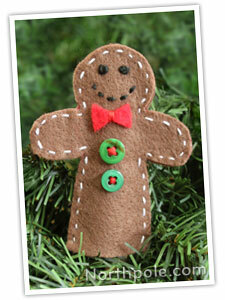 To finish sewing and hide the knot, feed the thread inside the puppet and trim. For more details on this technique, see this article. To make the body, sew or glue belly and beak onto one of the body pieces. Glue wiggly eyes and let dry. Sew around the outside, leaving bottom edges open. To make the hat, glue H2 on the bottom edge of H1. Let dry. Glue antlers onto H3. Let dry. Sew along top arc, leaving bottom edges open. Turn Perry over and sew hat to the back of his head. On one body piece, glue on wiggly eyes, snout, and belly. Draw nose and paws with black paint marker. Sew around edges, leaving bottom edges open. Cut a piece of red yarn that is 5" long. Tie yarn around Bart’s neck. Now he has a scarf! Turn Bart over and glue a white pompom for a tail. Let glue dry completely. 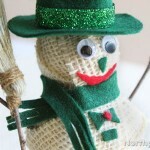 Sew a mouth on R1 with black embroidery thread or draw a line with a black paint marker. Glue wiggly eyes, and a mini pompom for the nose. Glue or sew belly in the middle of R1. Sew a miniature bell above the belly, if desired. Let glue dry. Glue antlers onto R2; let dry. Stack R1 on R2 and sew around the outside edges, leaving bottom edges open. On one body piece, sew bow tie and buttons. 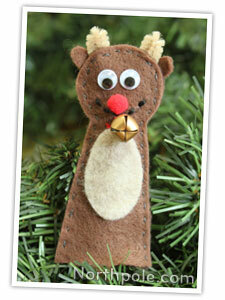 Use black paint marker to draw eyes and mouth OR use embroidery thread to sew the mouth and eyes. Stack body pieces together and sew around the outside edges, leaving bottom edges open. 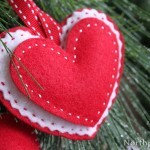 Note: Use white embroidery thread to sew the outside edge to look like frosting. Glue white stripes onto one candy can piece. Let dry. 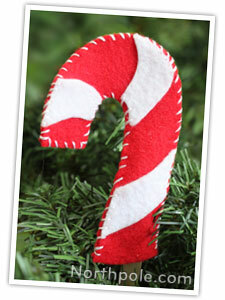 Stack both candy cane pieces together. Take one body piece and begin adding features. Glue wiggly eyes and let dry. Cut a piece of wire that is 4 inches long. Twist wire in loops to form glasses. 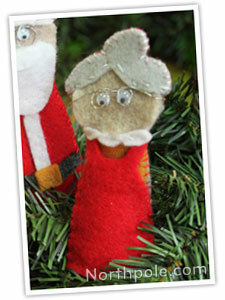 Wrap glasses around Mrs. Claus’s head and use hot glue to secure in place OR sew in place. Place apron on Mrs. Claus. Sew along bottom edge. Place collar on Mrs. Claus, it should slightly overlay the straps of her apron. Sew in place. As you are sewing, sew the apron straps. Glue wiggly eyes. Let dry. 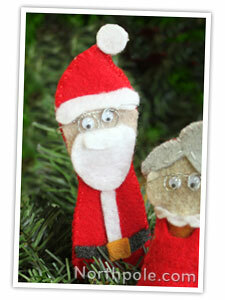 Wrap glasses around Santa’s head and use hot glue to secure in place OR sew in place. Stack the body pieces together, and sew along the outer edges, keeping the bottom edges open. Change the face color to green. Change mustache to green and cut a jagged edge. Cut a jagged edge in the beard to make it look scruffy. 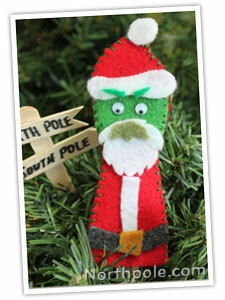 Sew with green thread to complete Grouchy Claus.